Pest monitoring There is no precise survey technique for evaluating spider mite infestations. Infestations usually begin on the lower portions of the plants and move upward as mite numbers increase. Evaluating spider mite infestations is most efficient if randomly selected, older, lower leaves are picked and inspected for stippling on the upper surface and webbing, mites, and feeding scars on the lower surface. Spider mite populations may be held at very low levels by a number of insect and mite predators, particularly early in the year. 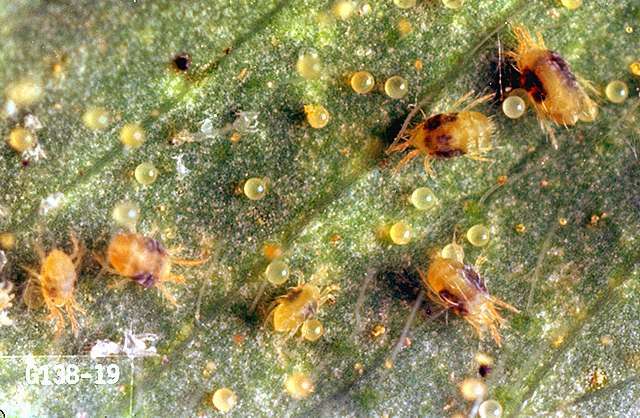 Thrips are effective early year predators, feeding primarily on spider mite eggs. Commercial releases of predatory mites are used to control spider mites in greenhouses. In Florida, predatory mites were used to control spider mites in strawberries. Spider mites provide an important food source for predators such as minute pirate and bigeyed bugs. Spider mite problems can be reduced by keeping fields and field margins clean of weed hosts. Spider mite populations may increase more rapidly in areas where dust deposits are heavy. Reducing dust may reduce the spider mite problem. Spider mites are usually less severe in sprinkler-irrigated fields than in furrow-irrigated fields. Excessive nitrogen fertilization also may contribute to population buildup. Minimizing early year insecticide applications, which reduce populations of beneficial insects, will reduce spider mite outbreaks. plant essential oils (soybean, etc. )-Some formulations are OMRI-listed for organic use. abamectin (Agri-Mek SC) 1.75 to 3.5 fl oz/a. PHI 7 days. REI 12 hrs. Do not exceed 10.25 fl oz/a per season. To avoid illegal residues, mix with a surfactant as recommended by the label. bifenazate (Acramite) at 0.33 to 0.5 lb ai/a. PHI 3 days. One application per season. Do not plant new crops within 30 days of application. Succulent shelled beans only. borate complex (Prev-Am) as a 0.4% to 0.8% solution. Spray to complete coverage. PHI 12 hr. REI 12 hr. Retreatment interval 4 days. OMRI-listed for organic use. dicofol (Dicofol 4E) at 0.5 to 1.5 lb ai/a. PHI 21 days. REI 33 days. Do not exceed one application per season. dimethoate (numerous products) at 0.25 to 0.5 lb ai/a. PHI 0 days when harvested mechanically. REI 48 hr. Do not feed treated vines. hexythiozox (Onager Optek) at 10 to 24 fl oz/a. PHI 14 days. REI 12 hr. Do not apply more than one application per season. Do not harvest or graze bean vines for hay or forage. naled (Dibrom) at 0.94 lb ai/a. PHI 1 day. REI 48 to 72 hr. Do not apply within 25 ft of an aquatic habitat, 150 ft if applied by air. phorate (Thimet)-Do not exceed 1.5 lb ai/a. PHI 60 days. REI 48 hr, or 72 hr if annual rainfall is less than 25 inches. Apply at planting. Do not graze or feed to livestock. Toxic to fish and wildlife. propargite (Comite) at 1.6 to 2.4 lb ai/a. PHI 14 days. REI 9 days. Do not feed any parts of treated plants to livestock. Do not exceed two applications per year. Dry lima beans only. sulfur at 2.25 to 6.75 lb ai/a. REI 24 hr. PHI: consult processor.